Have you always dreamed of installing a magical water feature in your back garden? With Bradshaws Direct voucher codes you can create a pond in almost any space without spending a fortune. From the latest in pond accessories such as filters, lighting and decoration to full kits allowing you to design your very own water feature, a Bradshaws Direct discount code is a great way to transform your garden for less. 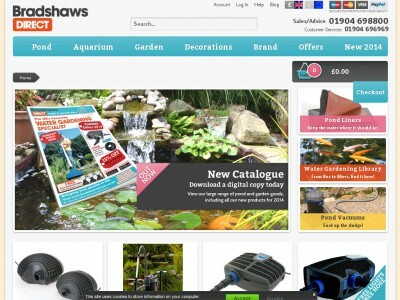 Founded in 1979, Bradhshaws Direct is the UK's number 1 home shopping supplier of water gardening goods and pond equipment. With their decades of experience, the company is an invaluable resource to anyone looking to design and build their own water feature from scratch as well as existing pond owners wanting to develop or maintain their water feature. Bradshaws Direct offers one of the widest ranges of pond products from all the leading manufacturers, including Hozelock, Oase and more. Their products are sourced from companies all over the world, with many new and innovative items you will struggle to find elsewhere. All of your water garden needs are catered for, with everything from pond liners and pond pumps to aquarium accessories, water features, decorative bridges, in-pond lighting and more available at competitive prices with via fast, secure online delivery. Pond hygiene can also be taken care of, with a variety of both chemical and natural treatments available to keep your pond clean, healthy and free of weeds. So whether you have just a small garden and you want a bespoke pond designed to fit the space or you want to make a start on that elaborate water garden you've always dreamed of, get in touch with Bradshaws Direct for everything you need. If you're just starting out in the world of water gardening and hoping to create your very own pond in your garden, you'll find the expert staff at Bradshaws Direct a fantastic source of support and information. Always on hand at the end of the phone, they can advise you on everything from which products to buy to what could be causing any problems you might be having. Inspired to try your hand at water gardening? With a Bradshaws Direct discount code you can enjoy great discounts on all the essential kits and accessories. Whether you want to improve on an existing pond with a dramatic water feature or get stocked up on liners for creating your own water garden, Bradshaws Direct voucher codes can help give your garden a makeover for less. Huge collection of products from leading suppliers around the world. Browse our website until you find a Bradshaws Direct discount code that suits you, then navigate to their website to begin shopping. Click on a product for more information then click 'Buy now' to buy. When you are finished shopping, click 'View basket'. Enter your Bradshaws Direct discount code in the box provided and click 'Apply discount'. Fill in your personal and payment details and click 'Place order now'. Almost finished shopping? Don't forget to add your Bradshaws Direct voucher codes to make big savings on your order. Standard delivery on items weighing under 250g is £2.99. Standard delivery on items weighing over 250g is £4.99. Delivery is free on items over £45. If you need to return a product for any reason to Bradshaws Direct, you can do so by simply returning it by post within 30 days of receipt. Need to contact the team at Bradshaws Direct? Whether you want some advice on designing and building your first water feature, have a query about your order or just want to find out more about saving money with Bradshaws Direct voucher codes, you can contact the Customer Services department by telephoning 01904 696969 or filling in the online contact form here. Want to find out more about building amazing water features with Bradshaws Direct? The company maintains a profile across all your favourite social media platforms. Follow them for water garden inspiration, product features, competitions and more. You can also use these pages to find out more about how you could save money with Bradshaws Direct voucher codes. Don’t forget to check them regularly, as you can never be sure when a free Bradshaws Direct discount code might be waiting for you! Buy now online at www.bradshawsdirect.co.uk. Once I worked digging ponds for the rich and fabulous; and once the stench of dead fish washed off, I came to appreciate the beauty of a water feature like the ones available from Bradshaws Direct. So whether or not you’re looking to get down and dirty yourself, find your way to a Bradshaws Direct discount code or some Bradshaws Direct voucher codes and shop online for the water fixture of your dreams. Every Bradshaws Direct discount code buys you a little more lift, and all of the Bradshaws Direct voucher codes score you savings on some serious pond power.